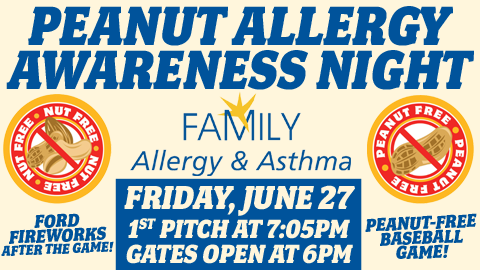 The Legends' seven-game homestand will open with Peanut Allergy Awareness Night June 27. 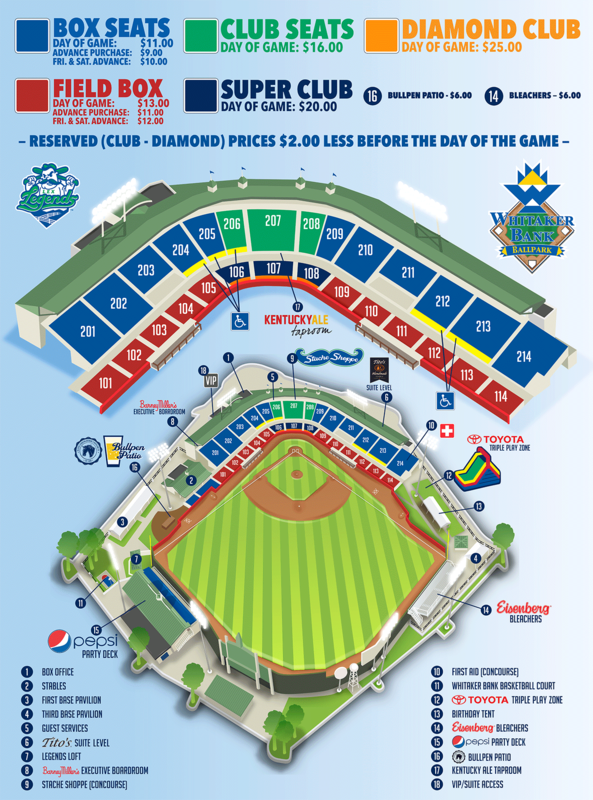 (WHITAKER BANK BALLPARK, Lexington, Ky.) A peanut allergy awareness night, three Ford Fireworks shows, including one for an Independence Day celebration, and a Bark in the Park night will highlight a seven-game homestand for the Lexington Legends beginning Friday, June 27. The Legends will also welcome a former Kentucky Mr. Baseball back to the Bluegrass. The Legends, class A affiliate of the Kansas City Royals, will take on the Augusta GreenJackets, an affiliate of the San Francisco Giants, in a four-game series June 27-30. The Greensboro Grasshoppers, an affiliate of the Miami Marlins, will be in for a three-game series July 1-3. Friday, June 27: Legends vs. Augusta, 7:05 p.m. The Legends and Family Allergy & Asthma are teaming up to provide a fun, worry-free evening for those with peanut allergies. At one game each year, the Legends remove all forms of peanuts, sunflower seeds and any foods prepared with peanut oils, so that fans may enjoy the game - and the concessions -- without concern about a possible allergic reaction. There will be giveaway items and chances to win prizes donated by Family Allergy and Asthma. A Ford Fireworks show will follow the game. Saturday, June 28: Legends vs. Augusta, 7:05 p.m. Saturday is Lexington Clinic Night, and fans should look for information and giveaways from Lexington Clinic representatives. A Ford Fireworks show will follow the game. Sunday, June 29: Legends vs. Augusta, 6:05 p.m. It's a JIF Kids Club Sunday. Kids Club members receive free admission to the game, and all kids may run the bases after the game. Monday, June 30: Legends vs. Augusta, 7:05 p.m. All Monday night home games are "Kids Eat Free" nights, sponsored by Members Heritage Federal Credit Union. All kids age 12 and under will receive a voucher good for a free meal and drink. Tuesday, July 1: Legends vs. Greensboro, 7:05 p.m. Every Tuesday night is 37-cent hot dog night. The price is in recognition of the Ford F-150 being the number one selling truck for 37 consecutive years. The visiting Grasshoppers have a Kentucky connection: Frankfort native and former Western Hills High School and University of Kentucky star J.T. Riddle is with Greensboro after being drafted in the 13th round and signed by Miami in 2013. Riddle was Kentucky High School Mr. Baseball in 2010. Wednesday, July 2: Legends vs. Greensboro, 7:05 p.m. Wednesday is Bark in the Park night, presented by IncrediPet. Fans may bring their dogs to the game. Thursday, July 3: Legends vs. Greensboro, 7:05 p.m. It's a Kentucky Ale Thirsty Thursday, and beer and Pepsi products will be on sale for one dollar each. There is no home game on July 4, so the Legends invite fans to celebrate Independence Day Thursday with a Ford Fireworks show after the game. For ticket information, call 859 422-7867 or go online to lexingtonlegends.com.